In the five years that I have spent in Southern California, I seemed to have ended up in the north and north-eastern parts of Arizona during many of my travels whereas, I haven't given the southern and its eastern border its due respect. I decided to correct that during the Thanksgiving break of 2004 when, with my wife, I took a road trip through this region. After wading through the mad holiday rush of Southern California at a snail's pace, we crawled to the outskirts of Phoenix late on the Thanksgiving eve. The following day, after a brief halt at the unimpressive road side ruins of Casa Grande, we spent the rest of the day at the Saguaro National Park. The park, divided into two sections by the city of Tucson, is dedicated to preserve the giant Saguaro cactus. These tall pillar shaped cacti grow to a height of 30 to 50 ft and live over 200 years. It used to be an important food source for the original inhabitants of the region. 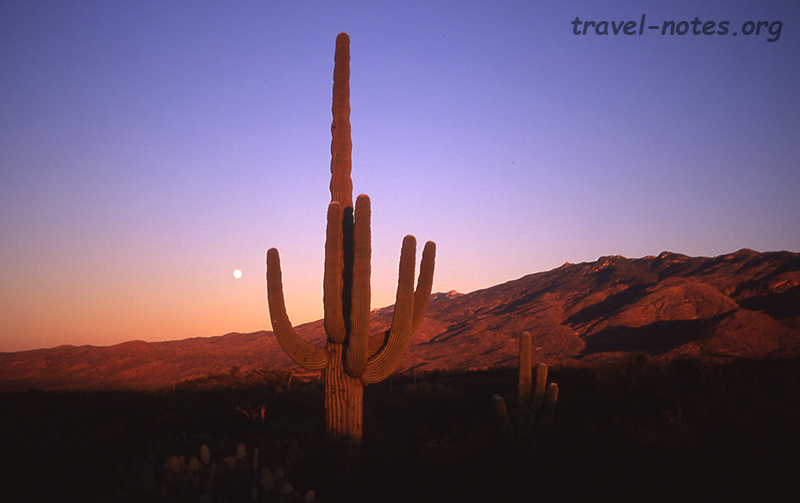 The highlight of our day was witnessing a stunning moon rise over the Saguaro filled desert. The primary agenda of our trip was to check out the three scenic drives in the region recommended by the National Geographic guide to the Scenic Byways. The first of the three was a drive to the ancient Mogollon Indian cliff dwellings in Gila, New Mexico. Although the drive was not out of the ordinary, the destination paid for our efforts. The dwellings were built in cozy warm caves with stunning views that only the million dollar counterparts of today manage to afford. The next drive was up US Route 191 between the cities of Clifton and Springerville popularly known as the Coronado Trail. 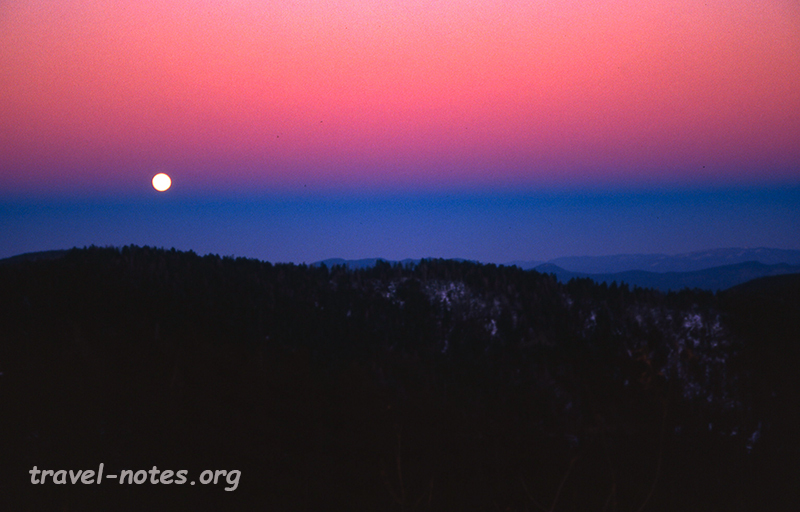 We were lucky enough to get to the highest lookout point on the trail, the Blue Vista (9,346 ft), exactly at sunset. We got to visit another amazing moon rise, this time over the hills. The only other view point on the trail worth mentioning is a peep into the largest open pit of Phelps Dodge mine, an important copper and zinc mining site. 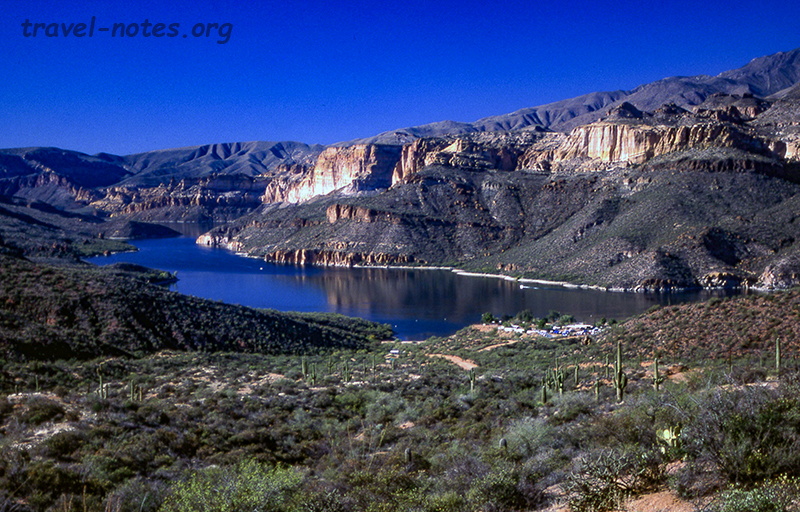 The last of the three drives was the 46 miles long dirt trail connecting Phoenix and Roosevelt also known as the Apache Trail. Due to the unpaved nature of the trail, it could take upto 3 hours to traverse it in either direction. 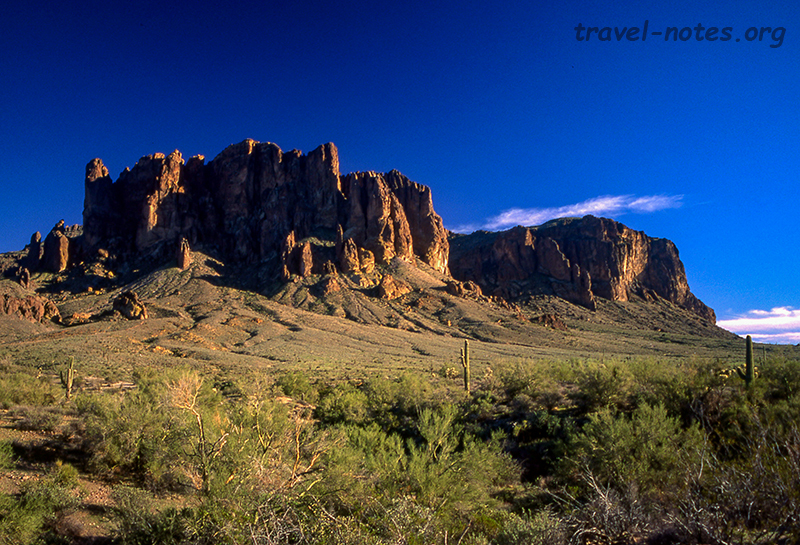 Located at the Phoenix end of the trail is the Lost Dutchman State Park which houses the dramatic Superstition Mountain and also (allegedly) some treasure put here by an unknown Dutchman which, not surprisingly, has never been found. Located near the Roosevelt end of the trail is yet another ancient Indian cliff dwellings of Tonto National Monument, this one built by Salado Indians around the same time as others in these regions. Both of these (the state park and the monument) were worth a peep and would have added at least an hour each to our drive. The highlight of the Apache Trail was definitely the 0.5 mile stretch where the road climbed 1500 ft from the base to the top of the fish creek canyon. Driving from Roosevelt also allowed us to drive on the open side of the cliff making the journey quite interesting. We spent our final night of the trip with one of my undergraduate college friends, Amps (Amar Preet Singh). After a "ruin" filled three days, overwhelming Punjabi hospitality was a welcome change! Click here for more photos from Saguaro National Park. Click here for more photos from Coronado and Apache trails.